With a deep interest in providing Pinnacle Financial Advisors’ clients with the highest level of technical knowledge and service, Neil van der Feltz works closely with his colleagues as a strategy and product analyst, helping illustrate the impact of complex financial plans using the latest industry software. A software aficionado and video game enthusiast, Neil often challenges himself to push technology to the limits and create unique solutions to workplace technical issues. When it comes to understanding the intricacies of technology and ways Pinnacle Financial Advisors can incorporate them into the financial planning process, Neil is the first to step up. As a strategy and product analyst, Neil provides personalized tech infrastructure and support for the office, while also integrating himself into the paraplanning process. Neil joined Pinnacle Financial Advisors in 2016 following time as a retail operation specialist, helping people with credit issues purchase vehicles. In this role, he worked with a range of groups to create solutions, oftentimes pulling together cross-functional groups to tackle existing challenges. Neil also took on the role of underwriting support specialist, where he helped with and checked loan underwriting, where his attention to detail and savvy was recognized for maintaining the highest accuracy among his colleagues. 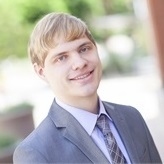 Neil holds a certification in Financial Industry Regulatory Authority (FINRA)’s Series 7 and Series 66 licenses, and his Arizona Life, Accident, and Health Insurance Producer and Variable Life and Variable Annuity Licenses. A graduate of Arizona State University, Neil received a Bachelor of Science in Physics and went on to earn a Master of Science in Physics. Deeply entrenched in serving his community, Neil has spent much time volunteering with City of Tempe and Kiwanis Park Recreation Center, where he taught children to play tennis. Neil lives in Mesa and partakes in a range of hobbies, including hiking, rock climbing, reading, singing and learning about other cultures.